16 Best Aquarium Plants for Beginners - Easy Care, Striking Beauty! Home Plants 16 Best Aquarium Plants for Beginners – Easy Care, Striking Beauty! If you’re considering a planted tank for the first time, we’re here to help with a buying guide and detail-rich list of the best aquarium plants for beginners. There are so many species of aquarium plants on the market it can be daunting selecting the best ones for you and your tank, especially if you are a beginner just learning the ropes. Buying the wrong plant for your aquarium can end in disappointment. Not to mention that certain plants are incompatible with some tank inhabitants and environments. In this article, you’ll learn what you should keep in mind while shopping for freshwater aquarium plants to include in your aquarium. We’ve outlined what makes an aquarium plant beginner-friendly and what you should expect regarding care. You’ll also discover the benefits of including plants in your aquarium, and which ones you should avoid and why. We end the article with a list of 15 of the best beginner aquarium plants, showing pictures, a ton of details, and which type of tank and fish the plants are best suited to. You’re likely wondering what the term “beginner-friendly” means when it comes to plants? Just like with your fish, different species of plants have distinct needs. Think about the reasons you chose to care for the fish you have now. You likely factored in their dietary needs, water chemistry requirements, and general maintenance into the equation. As you know, this can vary dramatically from species to species. Plants have the same considerations involved in their care. Some are high maintenance and require special fertilizer or supplements. Others are hardy and grow well, with little involvement on your behalf. Beginner plants falls into the latter category. You won’t have to worry about tweaking your lighting much or carefully measuring out doses of supplements. Overall care (thinning, pruning, etc.) is minimal. These types of plants can do well in the majority of aquariums. They can fit into an environment without you having to change aspects that may affect other inhabitants. Plants can help your aquarium look less artificial and more natural. After all, your goal as an aquarium owner is for all the residents of your tank to flourish. Recreating a natural environment isn’t just about the invisible aspects like water chemistry. Plants are found throughout natural bodies of water across the globe. It’s likely that the aquatic life in your tank would have had plants in their natural environments. The plants you choose can also give your aquarium a unique look. Choose those with an aesthetic and size that appeals to you. Aquatic plants are more than just decorative. They can provide shelter to the more vulnerable members of your tank. In natural bodies of water, plants play a key role in the dynamics between predators and prey. They can offer shelter to the more vulnerable residents of your tank, such as fish fry. Fish looking for shade will also appreciate aquatic plants in your tank. Some species of fish are omnivorous, meaning they eat plants too. For instance, goldfish can eat plant roots as well as pellets. Koi and carp will also consume them on occasion if they are available. Other types of fish, such as surgeonfish, are herbivorous (plant-eaters). Real plants can supplement a diet of pellets. Whether floating or rooted, plants serve as living filters for your aquarium. They break down nutrients from potentially harmful organic waste in your tank. Plants will keep your aquarium aerated too. Since they produce oxygen through photosynthesis, you can count on a steady supply of oxygen. Algae blooms are a concern for every aquarium owner. Aside from looking unsightly, algae can have negative effects on your tank’s ecosystem. These pesky plants can deprive your fish and other inhabitants of oxygen. Algae thrive when there are too many nutrients in the water. Plants can serve as a form of control. They use up these extra nutrients floating around your aquarium and prevent algae from taking over. Before you pick a plant for your aquarium, there a couple of things you should consider. You want to be sure that the plant is compatible with your setup and the look you’re going for. Picture what you want your aquarium to look like. Where do you want the plants to be? What sort of aesthetic are you going for? Aquatic plants come in diverse shapes, sizes, and colors. You may want something that is bright and vibrant, or more subdued. It all depends on your individual taste. The right placement is conditional on the plant. Some are intended to be placed in the background of your aquarium, others may be a foreground plant. If you don’t want to crowd your aquarium, floating species might be suitable. It is the large and tall varieities that are commonly termed ‘background plants’, because if they were placed front or middle in an aquarium, they would cover and hide everything behind them. On the lfip side, smaller short plants, and those that spread wide and form a sort of low ‘carpet’ are commonly called foreground plants, because they do not block the view of anything behind them. Unfortunately, some plants are inappropriate for smaller aquariums. Floating species with trailing roots can end up jamming your filter. Large rooted species could take up too much space. Think about maintenance in relation to your tank size. For example, a fast-growing plant might be fine with occasional trimming in a large tank. In a small aquarium, that same plant will have to be pruned regularly. You wouldn’t add new fish to your aquarium without putting serious thought into it. The same thing applies to adding new plants. Even if you buy a beginner-friendly plant, it may not suit your aquarium. You have to check that your current setup will work with the variety you’re considering. This means water chemistry, temperature, living inhabitants, and more. Remember that a healthy aquarium is all about balance. If one part doesn’t fit in with the established ecosystem, it can wreak havoc on your tank. You need to go over any plant’s care needs thoroughly. The ones you buy should be a match for your aquarium in every sense. Otherwise, you could end up with sick or dying plants or fish. In turn, this can be detrimental for the environment in your tank. You might gravitate towards floating plants but think about your existing tank inhabitants. Would blocking the light entering your aquarium cause harm? Don’t forget that fish can damage plants too. If your fish are aggressive, loosely rooted plants can be torn out. Omnivorous or herbivorous fish can destroy fragile species. You should also factor in your future plans for your aquarium. Are you going to upsize in the near future? Will you add a new species of fish? Lighting is crucial for plants. If they aren’t getting the correct lighting, it will weaken and could die. The lighting needs of your plants and other residents of your tank must be the same. You can’t have fish that prefer dim lighting with vegetation that needs strong light to grow. Your low light plants will suffer if you include a species that grows under medium or high light. You should never sacrifice quality of life in your aquarium for any exisiting inhabitants. Still, there are circumstances where you can find a compromise. If you have a brightly lit aquarium but are interested in low-light plants, don’t despair. Adding floating plants can provide shade for other species that need it, without significantly reducing light. All the plants we have listed below are easy to care for. However, some species grow aggressively while others take their time. If you choose a plant that grows fast, expect to prune it frequently. There are also those that need help to settle into your tank. They may need liquid fertilizer or supplements. If you’re not interested in keeping up with this type of care, pick a plant that doesn’t require it. Now that you know what to think about before you choose a plant, it’s time to look at some options. Below, we’ve listed 16 of the best aquarium plants for beginners. Regardless of what sort of aquarium you have, we’re sure there’s a plant in this list that’s right for you. As the name suggests, water lettuce bears a strong resemblance to lettuce. Each floating leaf looks like a small head of lettuce. Trailing roots hang down from the leaf’s surface. They grow up to four inches wide and 10 inches long, and can produce small white flowers. Water lettuce is believed to originate from either South America or Africa. It can be found nearly everywhere in the world today. Also known as duckweed, this plant grows in rivers and streams. Water temperature should be between 70 and 80 degrees Fahrenheit. It prefers mildly acidic waters with a pH of 6.5 to 7.5. Water hardness can range from 5 to 20 KH. The trailing roots of water lettuce are perfect for young fish fry to shelter in. As a floating plant, it can encourage low light conditions in your tank. This makes it ideal for fish and other plants that favor dim lighting. Keep lighting moderate with full-spectrum bulbs. Water lettuce does well with little human interference. The most important thing is to avoid high lighting, which can burn the plant’s floating leaves. Be sure to remove dead leaves as soon as you see them. Propagation – Can You Grow Your Own? Juvenile water lettuce can form at the roots of mature female plants. You will have to trim these periodically, otherwise, water lettuce will end up covering the surface of your tank. You have fish and plants that thrive in low light. The dense maze of roots water lettuce form is also good for shelter and shade. Water lettuce is adept at getting rid of excess nutrients. If this is a problem for you, water lettuce works as an efficient filter. You have fish or plants that require high lighting. Also, in smaller aquariums, the roots of water lettuce can get jammed in your filter. The firm favorite, Anubias nana can grow up to eight inches long. Their pointed, arrow-shaped leaves are a vibrant green color. Each leaf has a visible vein running straight down the center. These veins branch out to the perimeter of the leaf, giving them a slightly ruffled appearance. One of only a few commonly kept plants for freshwater aquariums that flower, Anubias nana can produce white blooms in spadix form. The flowers resemble smaller versions of calla lilies. Anubias nana originally hails from Western and Central Africa. In the wild, they grow in streams and rivers, although they can survive in marshes too. They grow from waterbeds as well as rooted on rocks and logs. For this plant to flourish, water conditions should be between 72 to 82 degrees Fahrenheit. Acceptable carbonate hardness (KH) for Anubias nana is 3 to 8. This hardy plant is compatible with most fish. Even herbivorous species will have difficulty eating the thick, tough leaves. Other plants that are suitable with Anubias nana are those that do well in medium lighting at higher temperatures. Lighting for Anubias nana should be moderate for 10 to 14 hours per day. Anubias nana grows slowly. It does well with substrate fertilizer and CO2 supplementation. You can grow more Anubias nana by cutting off rhizomes (plant stems) from the original plant. You have fish that like to nibble at plants, but you wish they didn’t – they won’t do so with Anubias nana. If you want a species that is low maintenance and easy to propagate, Anubias nana is for you. You have cold-water fish or need high lighting, this plant won’t work in your tank. If you’re looking for a species that will grow rapidly, don’t choose Anubias nana. Anubias barteri is perhaps one of the most popular beginner plants on this list. It has broad, arrow-shaped leaves of a bright green color that look fantastic and make a real statement in an aquarium. It can grow up to 16 inches wide and if well looked after can produce small, white flowers, as do other variations of Anubias. These beginner plants are native to Western and Central Africa. They grow attached to logs or rocks in streams, rivers, and marshes. Anubias barteri can also be found growing rooted in water beds. Optimal temperatures for Anubias barteri are between 72 and 82 degrees Fahrenheit. It can tolerate a pH of 6.5 to 7.5, and a KH of 3 to 7. As with Anubias nana, most fish are compatible with Anubias barteri. Aggressive herbivores will leave this plant alone. Other variations of Anubias will do well with Anubias barteri. Any variety or species that needs medium lighting and doesn’t mind slightly alkaline conditions will work too. Lighting should be 2–3 watts per gallon. Use daylight bulbs with a fluorescent fixture. Caring for Anubias barteri is straightforward. If you want to keep your plant smaller, trim new shoots growing from the rhizomes periodically. You’ll want to invest in a substrate fertilizer when you initially plant Anubias barteri. Although it isn’t essential, CO2 supplementation can promote growth. As with Anubias nana, Anubias barteri propagates via rhizome growth. This means that you can grow more just by cutting stems off your plant. You want an attractive plant that is resistant to nibbling herbivores. If slow growth, easy propagation, and little effort seem appealing, then Anubias barteri is for you. You want a species that will grow quickly. Also, If you’re keeping hard-water or cold-water fish, Anubias nana won’t grow well in your tank. Color Form: Ranging from light green to lime green. Flowers are less than an inch in diameter; white with three petals. Anacharis has branching stems with whorl-shaped leaves. The leaves can vary in color, from light green to vivid lime green. Each stem can grow up to 12 inches in length. Flowers grown by Anacharis are small, have three petals and are white. Also known as Brazilian waterweed, Anacharis is originally from South America. It is an invasive species that grows in both slow and fast-flowing water. This plant has been found growing in ponds, streams, ditches, and lakes. Anacharis can survive in temperatures as low as 59 degrees and as high as 82 degrees Fahrenheit. Similarly wide, the ideal KH range for this plant is from 3 to 8. Water pH should be between 6.5 and 7.5. Docile fish will enjoy sheltering and hiding in clumps of Anacharis. As long as a plant can tolerate medium light, it can grow in the same tank as this waterweed. Anacharis requires 2 watts per gallon from full-spectrum light bulbs. In tropical-climate aquariums, Anacharis will need fertilizer. Although it is not essential in coldwater aquariums, fertilizer can encourage better health. This plant grows rapidly and should not be left unchecked in any tank. You’ll have to trim the stems every so often to keep it neat. As an invasive species, Anacharis can reproduce swiftly. It can be propagated by cutting branches from adult plants. You have an aquarium with a lot of excess nutrients – Anacharis is a voracious grower and user of said nutrients. This plant is good for fish that have sheltering, hiding behaviors. You don’t want to trim it frequently to avoid overgrowth. If you have a tropical aquarium and don’t want to keep up with fertilization, choose another plant. Aquariums with aggressive fish shouldn’t include Anacharis. They can uproot the plant without much effort. There are numerous species of Cryptocoryne, also known as Crypts. Cryptocoryne wendtii is one of the most common beginner-friendly species. Cryptocoryne wendtii is a plant with many looks. Leaves can vary in shape and color, depending on the variety you buy. Lighting can also influence the plant’s appearance. Leaves can be reddish-brown, green, or olive green. They can be tapering and narrow, or broad – every individual is unique. Cryptocoryne wendtii is petite, it grows up to five inches in height and width. This plant is native to Sri Lanka, it can be found growing in rivers and streams. This tough species can survive in water with a pH of 6 to 8. It can tolerate a KH of 3 to 8, and temperatures from 72 to 82 degrees Fahrenheit. This slow-growing plant suits most tropical fish that like to take shade and shelter in plants. Other tropical species with a slow growth rate will do well with Cryptocoryne wendtii. You should keep lighting at a minimum of 2–3 watts per gallon. Use full spectrum bulbs. Cryptocoryne wendtii is a low maintenance plant. As it grows slowly, pruning and trimming are rarely needed. Take note that you will have to use iron-rich fertilizer for best results. If your Cryptocoryne wendtii isn’t getting enough nutrients, it won’t grow optimally. Remove one of the roots from your Cryptocoryne wendtii and replant it. Take care to make sure that a piece of stem is still attached to the root. You want a plant that remains small and needs very little care. If you have burrowing fish that uproot other plants, Cryptocoryne wendtii is a good choice. Its roots are strong and hard to dislodge. You have rapidly-growing plants that can crowd your Cryptocoryne wendtii. The leaves of Cryptocoryne wendtii can die off in large amounts when you first plant it. If you don’t want to deal with this, pick another species. One of the most popular plants for freshwater aquariums, Java fern grows in clumps of long, oval-shaped leaves. Each bright green leaf has a visible vein running down the middle and branching out to the sides. It can grow up to eight inches tall. This plant hails from Southeast Asia. It can grow fully or partially submerged. It is found growing on rocks and around tree trunks near streams and waterfalls. Java fern also grows on the ground of tropical rainforests. Java fern can handle temperatures from 68 to 82 degrees Fahrenheit. Water pH should be between 6 and 7.2, and KH from 3 to 8. The majority of tropical fish are compatible with java fern. Fish fry can shelter in the long leaves, and mature fish can take shade. Java fern is unappealing to most fish with a preference for nibbling on plants. This plant does well with other tropical species that require low to mid-light. For example, java moss, Anubias nana, Anubias barteri, and others. Aim for 2–3 watts per gallon of full-spectrum light. As long as your lighting isn’t too high, your java fern will tolerate it. Java fern grows at a slow pace and can be pruned occasionally. It isn’t necessary to supplement this plant with CO2 or fertilizer. You can even grow it on a bare-bottom tank or attach it to driftwood. Java fern reproduces through division. You can replant cuttings from the original plant and grow new java fern. Alternatively, you can check your plant’s leaves for new growth. You’ll spot small leaves growing, often on the underside of mature leaves. Cut these leaves off and plant them, and a java fern will grow. You’re looking for a versatile plant that will get along with a variety of tank-mates. Those of you who aren’t interested in frequent pruning will also appreciate java fern. You have larger, aggressive fish. Newly planted java fern can be uprooted easily. Java moss is an emerald green moss with fine, floating tendrils. As a moss, it spreads in carpets – how large these grow will depend on you. This moss originates from Southeast Asia. It grows on river banks, rocks, and tree trunks. As it originates from tropical climates, java moss prefers temperatures between 72 to 82 degrees Fahrenheit. Water pH should be 6 to 7.5. It can cope with both soft and hard water – from 3 to 8 KH. 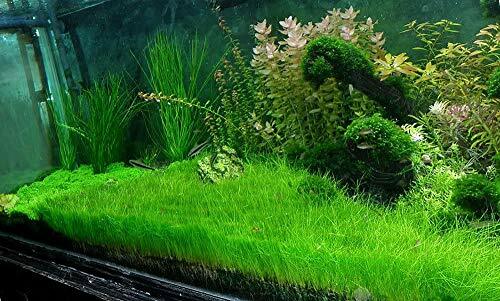 Java moss is suitable with almost any fish. The floating tendrils of moss are ideal for fish fry to shelter in. Young fry can also eat infusorians – microscopic organisms that are harbored in the moss. Other low-light plants can grow alongside java moss. Low intensity, full-spectrum light is best for this plant. Higher lighting will provoke faster growth, but you’ll risk algae forming on your moss. 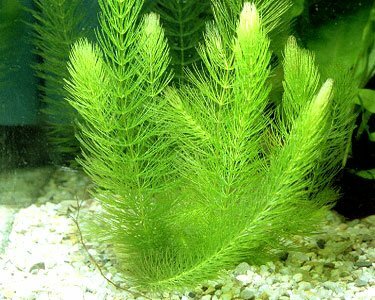 Since java moss grows slowly, maintenance is flexible. You can trim the moss or actively shape it so it grows over specific areas. You can also leave it free-floating, although you’ll need to watch that it doesn’t clog your filter. filters or begin to rot. Java moss does well with CO2 supplementation. Aquarium fertilizer is optional. 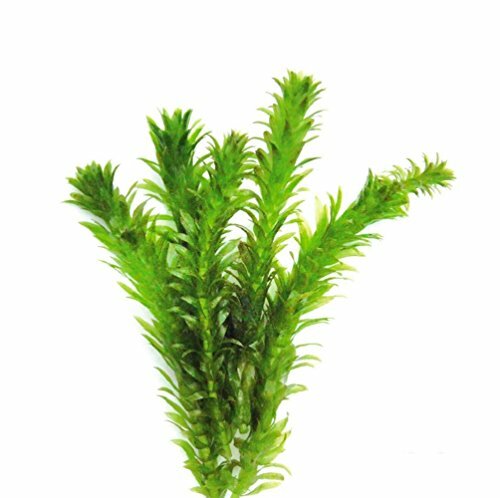 Java moss reproduces through division – growing your own is simple. Cut off java moss and place it elsewhere in your tank (or in a new one). It will grow from the cutting. You have a breeding tank and want to protect your fish fry. If growing a lush carpet of moss in your aquarium appeals to you, java moss is perfect. You have fish or plants that require high lighting. You don’t want to end up with your java moss covered in algae. 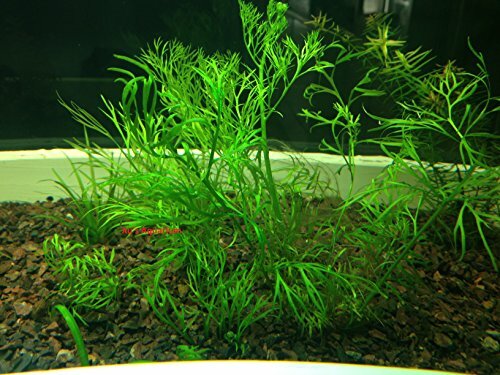 If you like to change your aquarium landscape often, avoid java moss. It is notoriously difficult to get this moss out of your tank once it settles in. Hornwort has emerald-green, hair-like leaves that can grow up to 1.5 inches long. The leaves grow in whorls around the stems. The stems of this plant can reach up to 24 inches long, and it can grow brown flowers, similar looking to its leaves. Originally from North America, hornwort now grows almost everywhere in the world, except Antarctica. Hornwort prefers to grow in calm, fresh water, at a distance from the shore. Horntail can grow in temperatures from 59 to 86 degrees Fahrenheit. KH can range from 5 to 15, and pH from 6 to 7.5. Since horntail can be found in bodies of water around the world, it will suit nearly any fish. As hornwort doesn’t need to be rooted, even aggressive fish can’t do much damage. If your tank includes scavenging fish or invertebrates – shrimp, for example, they can help clear up shed foliage. Low-light plants can do well with hornwort, as it grows fast and provides shade. Keep lighting medium but not constant. If lighting is too low or high, your hornwort will start shedding and turning brown. You’ll have to stay on top of trimming and pruning your hornwort. If not, the plant can take over your tank. This is particularly important if your hornwort is floating, as it can block out light if it grows untended. As you may have guessed, hornwort is classed as an invasive species. It reproduces through vegetative fragmentation. Stems separate from the original plant and form new ones. All you have to do to grow more hornwort is cut off a stem. If you want an attractive plant that will work to keep your tank clean. Hornwort secretes chemicals that prevent some microscopic plants from growing: it can help control algae growth. The thought of a species that sheds is unappealing. Even healthy hornwort will shed. If you have rooted plants in your tank that need light, floating hornwort won’t work. It grows fast and can stop light from reaching the bottom of your tank. There are roughly 80 known species of hygrophila. All have varying appearances and care needs. We’re going to tell you about Hygrophila corymbosa, one of the many beginner-friendly varieties. Also known as Narrow Leaf Temple, this beginner plant has broad, long leaves. If submerged, the leaves are light green. When grown out of the water, the leaves turn dark green. Hygrophila corymbosa can grow up to 24 inches in height. It spreads outwards and upwards as it grows. Originally from Asia, hygrophila can be found growing in swamps and streams. It is amphibious, growing both above and below the waterline. This tropical plant needs temperatures between 72 and 82 degrees Fahrenheit. Water pH of 6.5 to 7.5 is ideal, and KH should be 3 to 8. Smaller and shyer fish can shelter in the spreading leaves of Hygrophila corymbosa. Low-light tropical plants can also take advantage of the shade as your hygrophila grows. Provide 2–3 watts per gallon of full-spectrum light. Most species of hygrophila are aggressive growers – H. corymbosa is no exception. You’ll have to trim it frequently so that it doesn’t overtake your aquarium. If you want your Hygrophila corymbosa to thrive, you can add substrate fertilizer. That being said, it will also do well on its own. To grow your own Hygrophila corymbosa, cut a stem off and plant it. You may want to add fertilizer that includes trace elements (e.g. iron) to get the new plant rooted. You want a background plant that can grow to a decent height. Hygrophila are excellent for concealing aquarium equipment. You have a nano aquarium. Hygrophila corymbosa will have to be trimmed often so as not to crowd your tank. If your fish are plant-eaters, it might be a poor choice, too. Goldfish and other nibbling fish can eat this plant down to nothing over time. The reddish colored stems of this plant form clumps of rounded, dark green leaves less than an inch long. There are no leaf stalks – leaves are attached directly to the stem. When flowers grow from the stem tips, they develop as purplish-pink spikes. Rotala rotundifolia is from Southeast Asia. It is considered a weed, growing in moist soils and rice paddies. As an amphibious plant, it can grow both fully and partially submerged. Rotala rotundifolia prefers warmer temperatures from 72 to 82 degrees Fahrenheit. Water hardness can range from 3 to 8 KH, and pH from 6 to 7.5. Low-light, tropical plants will pair well with Rotala rotundifolia. The way this plant grows in clumps offers full shelter to fish fry and shy fish. Keep lighting at a low intensity with full spectrum bulbs. You can increase lighting intensity if you want to encourage faster growth and brighter colors. Rotala rotundifolia grows aggressively in moderate lighting and must be trimmed regularly. Lower lighting conditions will slow growth. 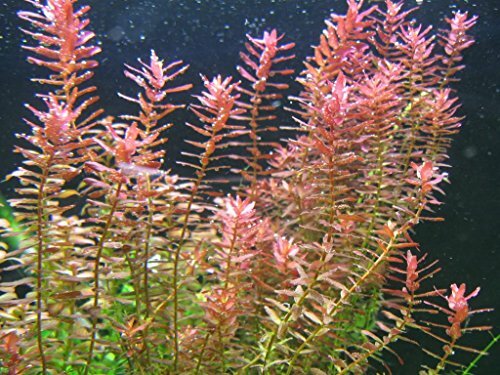 Aside from upping the light intensity, aquarium fertilizer will also enhance the colors of rotala rotundifolia. CO2 supplementation and lots of nutrients are necessary. If you notice your plant is weakening, you may need to add fertilizer. You can replant cuttings from your Rotala rotundifolia to grow more. Use fertilizer to get your new plant off to a good start. 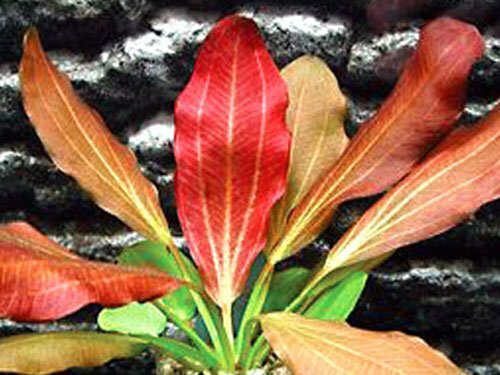 You want a unique-looking, colorful ornamental plant in your aquarium. You have large, aggressive fish. Rotala rotundifolia is fragile and can be damaged by these types of fish. Marimo moss balls are a vibrant dark green color. This moss grows as a rounded ball with fine hairs. You can buy this plant in different sizes. These plants originate from Japan, growing at the bottom of shallow lakes. Marimo moss balls need a mildly alkaline pH of 6.8 to 7.5. The temperature should be between 72 and 82 degrees Fahrenheit, with water KH of 3 to 8. Energetic tank residents, such as betta fish, will enjoy a Marimo moss ball. The moss ball can serve as an interesting item to interact with. Small scavengers, like snails and shrimp, can use this plant as a food source. Microorganisms live on the surface of the moss ball. To stay healthy, a Marimo moss ball needs at least 3 watts per gallon. Use full spectrum light bulbs. On average, a Marimo moss ball will grow 0.2 inches per year. There’s nothing to maintain with a healthy plant. You may need to roll your moss ball around so that it doesn’t stay on one side for too long. If your moss ball starts to brown or turn black, you’ll have to remove these spots. If you cut off a piece of your moss ball, it will form a new one. Remember that Marimo moss balls are exceptionally slow growers. It can take years before a freshly cut piece of moss ball gets any noticably larger. You want a low maintenance plant that active fish can play with. Marimo moss balls also do a good job of clearing your tank of excess nutrients. Plant-loving fish will have a hard time destroying Marimo moss balls. One of the reasons this plant shapes itself as a ball is to protect against hungry fish. You have a tank with little motion in it – little to no current. If this is the case, prepare to reach in and move your Marimo moss ball around. Micro sword can grow up to five inches long. Also known as Copragrass, leaves are narrow and elongated – like grass stems. Micro sword comes from South America. It grows on the banks of rivers, streams, swamps, and lakes. It can also be found growing partially submerged in swamps and wetlands. These tropical plants require a temperature of 70 to 83 degrees Fahrenheit. Moderately hard water KH of 4 to 8 is acceptable, while water pH should be on the alkaline side, between 6.8 and 7.5. Shrimp and other tiny scavengers can help keep micro sword free of algae. Fish and hardy plants that flourish under high lighting are compatible tank mates. Tanks of any size can include micro sword grass. You have the option of planting multiple plants or a single one. Lighting should be a minimum of 2 watts per gallon. Use bulbs that mimic full spectrum daylight. Fertilizer will help your micro sword plant take root in your substrate faster. If you want to keep them neat, frequent trimming is necessary. 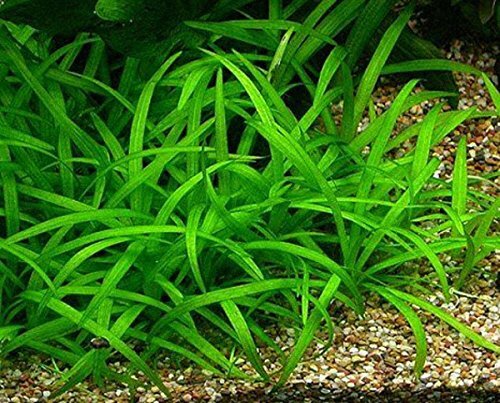 If you don’t trim it, this grass-like plant can carpet the bottom of your tank quickly. Micro swords propagate through runners branching off from the roots. If you want to help it reproduce, add more fertilizer and increase lighting intensity. You don’t mind keeping up with fertilization and want a fast-growing plant. If you keep small fish, they can use the plant for shelter and shade. You have fish that like to burrow. Micro sword has fragile roots. They also might not be for you if you don’t have filter-feeding organisms in your tank. Algae may form and be difficult to clean off the delicate leaves. Dwarf hairgrass grows as light green fine filaments. It looks like slim-bladed grass and can grow up to five inches in height. Small reddish-brown flowers can grow at the tips of the leaves. This plant is originally from North America. Today, it can be found across Europe, Asia, and South America. It grows in brackish water, such as bogs. Dwarf hairgrass can handle a water pH of 6.5 to 7.5. Water hardness should be between 4 and 8. Aim to keep the temperature at 70 to 83 degrees Fahrenheit. Dwarf hairgrass does best with background or mid-ground plants. Floating plants are compatible, as long as enough light can reach the bottom of the tank. Docile, small fish can make use of dwarf hairgrass for shelter. The same goes for invertebrates and fish fry. Dwarf hairgrass needs at least 2 watts per gallon of moderate lighting. This is a fast-growing plant and will have to be trimmed regularly. Frequent trimming will also encourage your dwarf hairgrass to grow thicker. Dwarf hairgrass does require fertilizer for ideal growth. Without fertilizer, it can eventually sicken and die. Dwarf hairgrass reproduces through runners attached to the roots. You can cut off runners and plant them elsewhere in your tank. This is likely unnecessary, however, as dwarf hairgrass grows and spreads fast. You want to carpet the foreground of your tank in vibrant green grass. If you have soft substrates such as sand, dwarf hairgrass is a good fit. You have a hard substrate that doesn’t fertilize well, such as gravel. If your fish are aggressive or eat plants, they can destroy dwarf hairgrass. Dwarf Sagittaria has long slender stems that grow straight upwards. The leaves are green and narrowed. This grass-like plant can reach up to 12 inches. It can grow flowers that are white with three petals. Native to Columbia, dwarf Sagittaria grows in brackish waters. It is found in estuaries, marshes, and by the sea in shallow water. Water temperature should be kept at 72 to 82 degrees Fahrenheit. Dwarf Sagittaria can tolerate water hardness between 3 and 8 KH. It suits a water pH of 6.5 to 7.5. Variations of Anubias have similar needs to dwarf Sagittaria. This plant does well with most species of fish. As the leaves grow close together, it offers prime shelter for mature and young fish. Provide at least 2 watts per gallon of lighting. Use full spectrum bulbs. Dwarf Sagittaria is a resilient plant. It can grow without fertilizer, so long as you keep the light intensity moderate to high. You have options when it comes to shaping your dwarf Sagittaria. If you grow it separate from other plants, it will widen. If you keep it near other plants, dwarf Sagittaria will grow vertically. Dwarf Sagittaria reproduces by itself through runners. If you want to spread it to other areas of your tank, cut off runners and replant them. You want a plant with a moderate growth rate that’s flexible. You can have it grow as a carpet, or in the mid-ground. If you don’t have a substrate that’s nutrient-rich and your tank inhabitants can’t stand medium to high lighting. Indian red sword has long sword-like leaves of varying colors. Depending on the individual, leaves can range from vivid red to light brown or green. Echinodorus uruguayensis and Echinodorus aschesrosonianus. The Echinodorus genus of plants grows in swamps and shallow water in South and North America. Indian red sword needs a pH of 6.5 to 7.5 and a KH of 3 to 8. The ideal water temperature for this plant is 72 to 82 degrees Fahrenheit. Docile fish with similar water chemistry parameters suit Indian red sword. High and moderate-light tropical plants can do well with Indian red sword. You should keep light intensity medium to high. Try for at least 3 watts per gallon of full spectrum light. Keep the lights on for 10 to 12 hours daily. Indian red sword is a swift grower. You can find new shoots growing off the leaves once a week. If you want to keep your plant small, you’ll have to trim these off as they grow. Aside from trimming, Indian swords are survivors. You won’t have to do much besides removing dead or dying leaves. Cut off growing shoots from your Indian sword plant to produce new ones. Use fertilizer to get the new plant growing. You want visually striking decorative vegetation with little maintenance. If your tank is a high light environment, Indian red sword will prosper. Water sprite has slim branches with fern-like, light green leaves. The leaves grow plentifully along each branch. It is capable of growing to up to 23 inches in height. This plant grows naturally in swamps, marshes, and in slow-flowing rivers. It grows throughout Asia, Australia, North and South America, and the West Indies. Water sprite can grow in cold-water as well as tropical tanks. Acceptable water temperatures are from 68 to 82 degrees Fahrenheit. It can tolerate water ranging from 5.5 to 6.5 in pH. Water hardness can be from 3 to 8 KH. The abundant leaves offer shelter and shade for mature and young fish. Freshwater shrimp can explore between the branches. This versatile plant does well in most tanks. It can handle a range of water chemistry parameters. If you have a low-light tank, float your water sprite for extra shade. If your aquarium requires a higher light intensity, plant the water sprite instead. In natural environments, water sprite grows in both shady and sunny locations. Water sprite will survive in your tank under low to medium lighting. You can either plant water sprite in your substrate or allow it to float freely. Trimming is on an as-needed basis. If you see that your water sprite is starting to grow too large, trim the branches. Water sprite takes nutrients straight from the water, rather than from its root systems. If you notice your water sprite doesn’t look healthy, add supplements. Trim a mature stem off and replant it. You can also drop the stem in another part of your tank to float, and it will grow. Just make sure the stem has a fair number of leaves on it. You want a hardy plant that can be floated or rooted. Water sprite can survive in almost any type of aquarium and needs little care. You have lots of snails in your tank. They will feed off and destroy water sprite. The same is true of goldfish and others that are partial to eating plants. We hop now you’re familiar with many of the best aquarium plants for beginners on the market. All of these plants are simple to care for and forgiving of mistakes. The next step is determining which will do best in your tank? Remember, plants should enhance rather than detract from the environment in your aquarium. The right species should benefit all your current aquatic life. If there are any plants that are beginner-friendly we haven’t mentioned, please do tell us in the comments section below. We’d also love to hear your experiences with nay of the plants discussed above, or be happy to answer any of your questions, so please do drop us a line, we answer every comment!